Seriously Spotless, Seriously Soapy is made with only the finest natural ingredients to keep your skin clean and nourished. 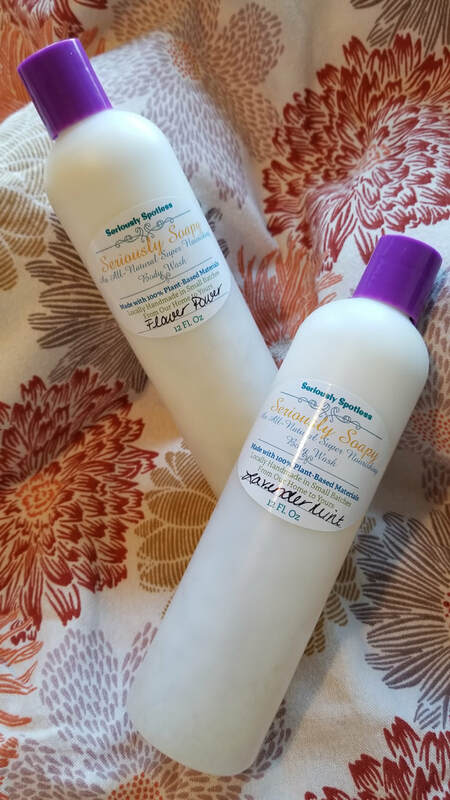 Rose water and aloe vera will soothe, goats milk helps to cleanse, raw organic shea butter adds essential vitamins and fatty acids back into your skin while all ingredients will work together to nourish, soothe and soften, leaving your skin feeling clean, refreshed and beautiful. Directions: Squeeze a small amount onto a dampened bath sponge and lather into skin. Rinse with warm water. Follow with Seriously Silky, Body Butter for glowing, ultra-nourished skin. Caution: Although this product is made of completely all-natural ingredients, it is not recommended for consumption. If product comes in contact with eyes or is ingested, flush with water and contact your health care professional. If not being used daily, store in a cool, dry, dark area. Prolonged exposure to sunlight can weaken product. Shake well before use. Like us on Facebook! & Follow us on Instagram!